A new joint report by R4D’s Center for Education Innovations (CEI) and UNICEF shares the story of five promising innovations as they attempt to scale and ultimately improve educational outcomes. 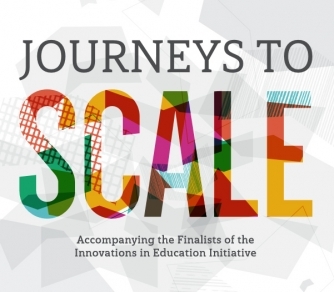 Journeys to Scale accompanies programs from Brazil, Ethiopia, Ghana, Peru, and Sudan, as they strive to increase their impact. Drawing from the challenges faced and strategies employed to overcome such hurdles, it lays out clear recommendations for implementers, donors, policymakers and researchers who want to support innovation. The report comes on the heels of recent research by the International Commission on Financing Global Education Opportunity, which found that 330 million primary and secondary school students do not achieve even the most basic learning outcomes of literacy and numeracy.